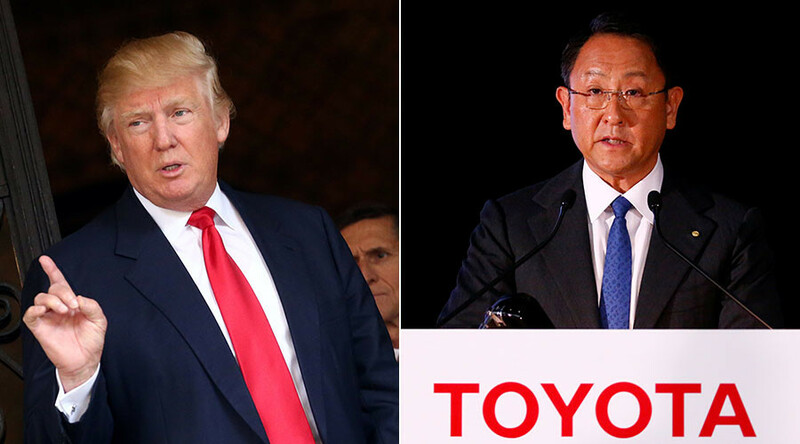 President-elect Donald Trump has threatened Japanese carmaker Toyota with a “big border tax” if they build a plant in Baja, Mexico. Toyota replied that its plans would not affect US jobs, but that didn’t prevent its stock from going down following Trump’s tweet. However, It appears Trump didn’t get some of his facts straight. Toyota’s $1 billion factory in Baja was built in 2004 and replaced production of their Corolla factory in Canada. It is likely that Trump was referring to Toyota’s $1 billion dollar plant in Guanajuato, Mexico, which the company announced plans to build in April 2015. Construction already started in November last year. After Trump’s tweet, Toyota stock dropped by more than 0.5 points, hitting a low of $120.45 on the New York Stock Exchange. Toyota Motor stock drops more than $1,200,000,000.00 in 5 minutes after Trump's tweet about their Mexico Plant. On Thursday, Toyota responded to the President-elect on Twitter, assuring that no production or manufacturing jobs would be leaving the US. In a full statement, the company said that they have been “part of the cultural fabric in the U.S. for nearly 60 years." They also pointed out that they have invested more than $21.9 billion in the US economy and employ over 136,000 Americans. Toyota did not shy away from talking about their plant in Baja, pointing out that even though the plant is across the border, it still supports production at their plant in San Antonio, Texas. The company also pointed out that it has recently expanded manufacturing jobs in Kentucky, Alabama, Indiana, and West Virginia, adding over 1000 jobs, and investing $700 million into the US economy. On Thursday, Toyota President Akio Toyoda told reporters at Reuters that he is going to wait until after Trump’s inauguration before deciding whether to make any changes. "We will consider our option as we see what policies the incoming president adopts." This is not the first time that Trump has tweeted about major manufacturers in the US. On Tuesday, Trump also threatened GM with a border tax should it expand production of the Chevy Cruze to Mexico. Ford responded by announcing that it will invest $700 million in a plant in Michigan instead, with Ford’s CEO saying the decision had nothing to do with Trump’s threat. Trump congratulated them on their choice.